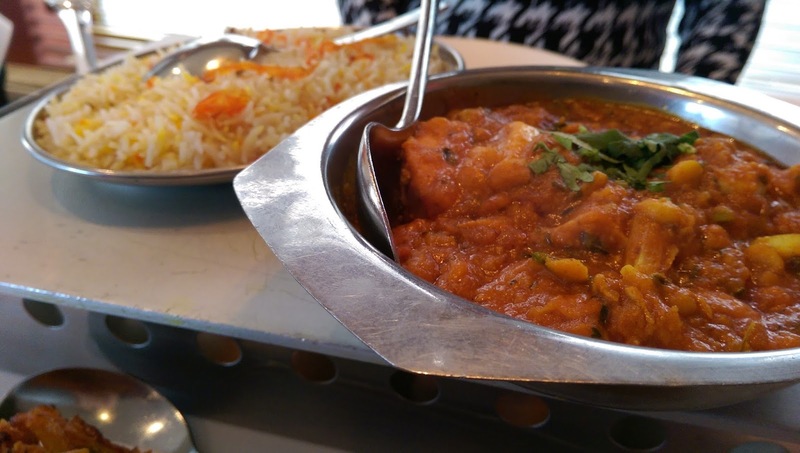 Myself and Nicola were recently invited through to the Midlothian town of Dalkeith in order to review Itihaas Bangladeshi & Indian Restaurant. Our visit would involve a round trip of around 120 miles so we decided that a lunchtime visit would be the most practical option for ourselves. With the booking scheduled for last Saturday, we set off on a very wet and windy morning in the hope that that the weather was better at the other end on the M8 motorway. I had never visited Dalkeith before and was surprised to see that it has played a pretty important part in Scotland's rich tapestry, contributing to politics, music and sport. Oliver Cromwell's army had made an earlier visit to Dalkeith, leaving his General George Monck as Commander in Scotland operating out of Dalkeith Castle. William Gladstone started his campaign to be British Prime Minister in the old market town whilst more recent exports include Fish, lead singer of Marillion, and former Manchester United player, Darren Fletcher. The weather hadn't improved much by the time we arrived but fortunately we only had a short walk from the nearby car park at the local Morrisons supermarket. (Maximum stay is 3 hours) the restaurant was quiet when we arrived with just one couple tucking into their starters and we were seated quickly at a table by the window. The owner, Matin Khan, came out to greet us and explained that he was busy working in on his latest venture, Eskmill, a cafe/restaurant situated directly across the road from where we were sitting. After a brief chat, he left us to get on with our lunch whilst instructing us to come over to the new place before we left. 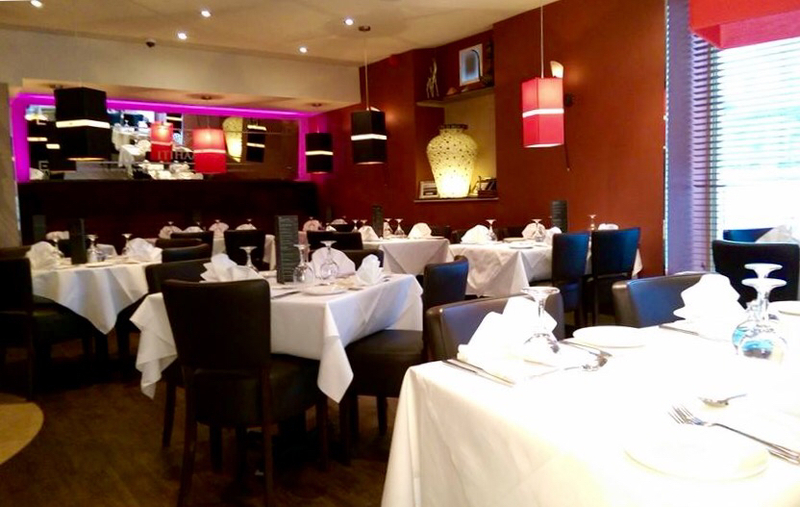 The restaurant is decorated with modern styling and although the expected Indian music was playing on the sound system, the music was also modern and upbeat helping add to the contemporary design and ambience. The full a la carte menu is available but we were both keen to eat from the very good value for money lunch menu. 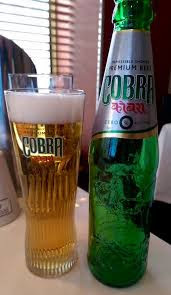 Nicola relaxed with a large glass of Spanish Airen/Chardonnay (which is only £12.95 for the whole bottle) but as I was driving I couldn't partake in the draught Cobra beer but could at least get in the mood with a chilled bottle of Cobra Zero - one of the better alcohol free beers on the market. Brownie points were awarded when we were offered a jug of iced tap water without having to ask. As we took time to look over the menu, we were presented with crisp poppadoms and a tray of accompaniments including a zingy, spicy lime pickle, a cool minty raita, a sharp and sour sauce, and some of the best spiced onions that we have tasted. Seriously, the onions were so moreish, with diced onions, carrot, cucumber, mint and chilli, working together to offer a fresh take on the usually overly tomato sauce laden onion starter. 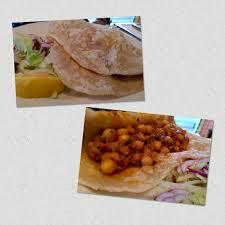 Nicola decided to order two courses from the lunch menu, starting with a chana on puri that we shared between us. Just as well we shared because it was a huge starter that would have defeated Nicola if she had to take it on herself. The puri, a deep fried puffed bread, was light and airy and despite being deep fried it showed no signs of greasiness. The chick pea filling was immense. Hot and spicy, sweet and sour with a good handful of fresh coriander mixed in to help ad a fragrant balance. This was one of the tastiest Indian starters that we've had in a long time. Nicola had struggled to choose a main dish from the lunch menu, not because there was nothing she liked, but because it looked like the menu had been written especially for her complex palate. In the end, she settled on the Garlic Chicken with pilau rice. Itihaas don't scrimp on portion sizes and the main course that Nicola received was packed with giant chunks of tender, well seasoned chicken breast. The sauce had a good balance of spice without being too hot, preserved lemon had been added to add another dimension to the sauce and there was a noticeable amount of garlic present round the dish off whilst keeping the vampires away. The pilau rice was another delight, heavy seasoned with star anise and topped with preserved orange peel, helping add further levels of flavour to an already tasty curry. The lunch menu costs just £7.95 for two courses which I think you'll agree, offers great value for money. I had opted for the Lamb Thali lunch experience - a new offering at Itihaas (Thali is an Indian meal made up of a selection of various dishes, the word Thali means a round platter used to serve food) - and was delighted with the value for money that I this offered. 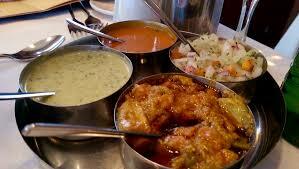 Each day the chef prepares a medium spiced curry that is the base for the Thali. 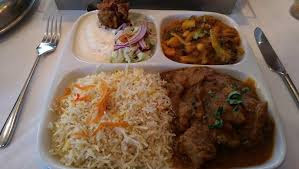 On the day, my lamb thali was served with the same delicious pilau rice that Nicola had, curried vegetables, an onion bhaji, dipping sauce, salad and a fresh chapati. Again, the portion size was a winner and I knew that we would be taking home a 'doggy-bag'. The onion bhaji was crisp and well seasoned, the curried vegetable were fantastic, especially the broccoli that seemed to soak up the spices with ease. As for the lamb curry, it was wonderful. The huge pieces of lamb were so tender that the broke up with little pressure from my fork, the sauce was like a good bhuna with notes of cinnamon, cumin and coriander fighting their way through a rich tomato base. 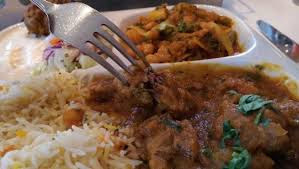 The Thali Lunch starts at £6.95 for the vegetable option, lamb and chicken cost £7.95 whilst prices can tip the pocket at £12.95 for the King Prawn Thali. As predicted, we were both defeated by our larger than normal lunch so we asked if we could take the leftovers home with us and they were neatly packed up in time for us finishing our drinks. Unfortunately, the rain was still lashing down by the time that we had finished lunch but we struggled across the road to say goodbye (and thank you) to Matin, but not before he gave us a whistle stop tour of the Eskmill. The new venture will be a great place to stop for lunch for those that don't fancy curry at lunchtime as Eskmill will be serving coffee, cakes, soups, sandwiches, and hot food to 6pm every day. Despite the awful weather and lengthy drive, we had a great afternoon in Dalkeith and loved our lunch at Itihaas. We were invited through for review purposes but the report above is an honest write-up based on our experience on the day. The service was attentive without being overbearing, all of the food that we had was packed with flavour and based on the portion sizes that we were served, we thought that the lunch menu offered great value for money. 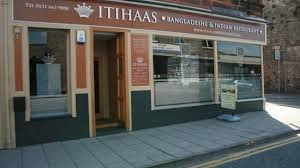 We would like to thank Matin and his staff for the hospitality shown on the day and should we ever be stuck in the Edinburgh area and in need of somewhere to eat, we know that Itihaas is only a short drive from the capital. Keep up to date with Itihaas on Facebook and Twitter.